Jaguar XJ220 (ジャガーＸＪ２２０) is a racing game developed by Core Design for the Sega Mega-CD. Similar to the Lotus series, the majority of the game is centered around one brand of car, in this case, the Jaguar XJ220, which at the time was the fastest supercar available for public purchase (it would be beaten by the McLaren F1 in 1994). In the game the player races across 12 different countries in a Jaguar XJ220, which can be upgraded and tuned. It also features a track editor. Core Design only had the rights to use the Jaguar name, but nevertheless includes vehicles by other manufacturers under slightly altered banners, including Ferrino (Ferrari), Bezantti (Bugatti), Sktuck and Felini. 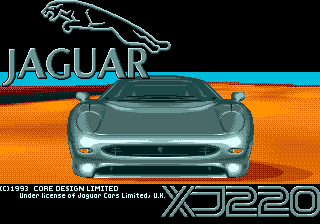 Core Design released Jaguar XJ220 for the Amiga in 1992, but while it shares the same name and a similar concept to the Mega-CD version, the two are very different aesthetically. In addition to full motion video sequences and a CD audio soundtrack, the Mega-CD version uses hardware sprite scaling, more detailed graphics and adds qualifying laps to proceedings, as well as completely overhauling the menus. On the Amiga, Core used real opponent supercars despite not having a license to do so. They are not referenced in game, but the Porsche 911, Lamborghini Countach, Ferrari F40 and Nissan Skyline are all visible, as are advertisements for Computer and Video Games magazine, all of which were removed in the Mega-CD version. Main article: Jaguar XJ220/Magazine articles.